The death of Jaemin Rhee PhD ’01 appears to be a suicide. David D. Clark SM ’02, a friend of Rhee and a member of the Ptolemy Players, the chamber music group that she founded, said that Rhee had written a brief note before her death. Public Information Officer of the Cambridge Police Frank Pasquarello said that the official investigation was ongoing and that no official cause of death had been determined yet. Rhee was found in her apartment by one of her friends on Monday, April 8. Shayan Mukherjee PhD ’01, a postdoctoral fellow in Course IX and a friend of Rhee’s, said that she died from an overdose of Valium. He said that the note mentioned that “she has some rent due,” but it was “literally a note” and no more. Mukherjee said the note did not mention a reason. The note “wasn’t really much of anything as far as I know,” he said. Her suicide “was a complete surprise,” he said, because right now “didn’t seem like a particularly bad time,” said Anand D. Sarwate ’02. Sarwate said that in the past Rhee had suffered from periods of depression and had been hospitalized for panic attacks. He added that Rhee had undergone therapy and was careful to follow treatment. “She was doing all the right things” to stay healthy, he said. Sarwate said a possible factor might be that she was “kind of stressed out” because she was participating in an upcoming research conference. He also said that she had not yet decided what she would do in the fall as her fellowship would have ended this year. Rhee’s suicide is the first in the MIT community since 2001, when Julia M. Carpenter’s ’02 death was ruled a suicide by cyanide poisoning. Prior to that, there were four suicides in 2000, including the death of Elizabeth H. Shin, whose parents are currently pursuing a wrongful death suit against MIT. 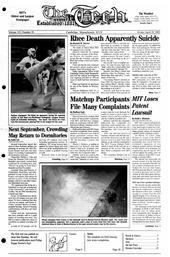 There have been a total of 43 suicides at MIT in the last 38 years. Many of the recent student deaths have raised larger questions for MIT to address. Shin’s death, for example led to a controversy about the effectiveness of MIT Medical’s mental health counselling and the importance of confidentiality. Ultimately, Shin’s parents decided to file a lawsuit against MIT, calling into question MIT’s decision not to inform them that Shin spoke about committing suicide to the doctors she saw at MIT Medical. Carpenter’s suicide forced MIT to reevaluate its policies on harassment after an harassment incident possibly related to her death. Since Shin’s suicide, MIT Medical has taken steps to make its mental health program better known among students and also easier to access. Students can receive immediate assistance on the phone or, usually, come in the same day for an appointment. Chief of Mental Health Services at MIT Medical Alan E. Siegel said that the counselors “see a whole range of people who have problems and concerns,” including stress, substance abuse, loneliness and depression. Rhee’s passion outside of her research was performing and enjoying music, and one of her greatest gifts to MIT was founding the Ptolemy Players. Consisting of current and past students, Ptolemy fills a gap in the opportunities for performance and enjoyment of music at MIT. Ptolemy is “really an opportunity for musicians to get together over the off season” and play, said Peter Jung ’01, a cellist in Ptolemy. Rhee was in charge of organizing each concert and would choose the theme of each concert, Sarwate said. She had “a lot of contacts in the Boston music scene,” he said, and in one case contacted the composer of a piece they were playing and got him to come listen to the group and give suggestions. Sarwate said that the Ptolemy Players were organizing a memorial concert for Rhee to be held possibly May 17 or 24. Rhee, 33, was a McDonnell-Pew postdoctoral fellow in Professor Steven Pinker’s lab in the Department of Brain and Cognitive Science. Rhee received her undergraduate degree from Harvard in 1993 and then a PhD in cognitive neuroscience from MIT in 2001. She is survived by her parents, a brother and a sister.